Comcast is making it even easier for its broadband subscribers to access the Internet outside the confines of their homes. For the past couple of years, the company, along with several other cable operators, has been building out a Wi-Fi network in public areas, such as train platforms and in small businesses such as cafes and retail locations, to allow its broadband customers mobile access to the Internet at no additional charge. The company has announcements that will expand this network. The first is the launch of the new home-based, neighborhood hot-spot initiative, in which subscribers will host Wi-Fi hot spots that other Comcast customers can use as part of their monthly broadband service. The way it works is that Comcast subscribers who are using the company’s newest wireless gateways for home Wi-Fi will broadcast an additional Xfinity Wi-Fi signal. And that additional signal will be the one that other Comcast customers, who already have access to Comcast’s public Wi-Fi network, will use. This signal is completely different from the signal that subscribers have in their home. This means that if customers subscribe to a 50Mbps broadband service, they will have full access to that speed and capacity, without any interference or degradation in service from the public Wi-Fi portion. Indeed, it also means that people can keep their home Wi-Fi networks more secure. Instead of giving out their password to visitors, these people can use the public Comcast Wi-Fi network, which is transmitting from the same gateway device. The only catch is that the visitors must also be Comcast Xfinity broadband customers. If they are not, they can get free access to the networks on two separate occasions. But after that they will have to pay for usage. Comcast started testing the new service last year in parts of Pennsylvania, New Jersey, Northern Virginia, and in and around Washington, D.C. Currently, more than 100,000 Xfinity Internet subscribers are using the new Wi-Fi access points. Nagel said that customers will have the option to opt out of the community broadband initiative if they would like. But the new gateways that are being deployed in broadband subscribers’ homes by default will have the community Wi-Fi signal turned on. The initiative is similar to a service that a Spanish company called FON launched in 2007. Just like Comcast, FON allowed people to share their home broadband connections via Wi-Fi. The router split the signal into a private signal used by the broadband subscriber indoors. And it also created a public signal for others to use outside of the home. The idea behind FON was that people who participated in the network were given access to other FON users throughout the world. So if someone who lived in San Francisco and participated in the FON network traveled to Madrid, he would be able to access free Wi-Fi if he came in contact with other FON networks. But the benefit for Comcast subscribers is not as easy to determine. Xfinity customers already get access to all of Comcast’s Wi-Fi hot spots at no extra charge. It’s bundled into their home broadband service. So in many ways, there is really no incentive to participate in the Comcast community Wi-Fi initiative. But given that customers have to opt out of the program, there’s a good chance that many people won’t even realize they are providing public Wi-Fi from their home broadband connection, simply by using Comcast’s gateway product. Wi-Fi has increasingly become an important part of Comcast’s overall strategy. And Nagel said that the home-based neighborhood hot-spot initiative complements the company’s existing Wi-Fi network and its efforts within the CableWiFi Alliance, which allows Comcast broadband customers to also get access to indoor and outdoor hot spots set up by other cable operators in other parts of the country. 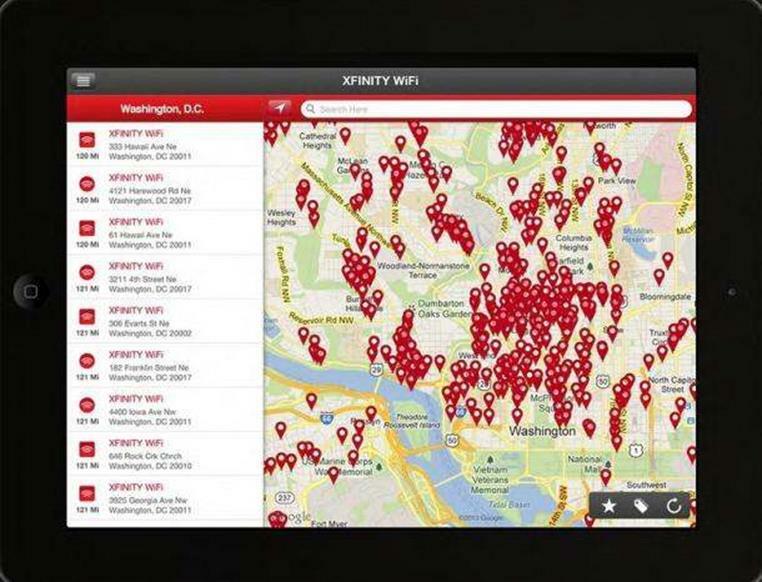 Map of Comcast Xfinity Wi-Fi hot spots in and around Washington, D.C.
Also, Comcast and its CableWiFi Alliance partners announced that they have added tens of thousands of new access points to the network. And now Cablevision, Comcast, Time Warner Cable, Cox Communications, and Bright House Networks’ broadband customers have access to more than 150,000 indoor and outdoor Wi-Fi hot spots in more than a dozen major cities across the country. The way it works is that subscribers of any of these broadband providers can look for the “CableWiFi” network on their mobile devices. Then they can sign into the network using credentials that identify them as a broadband customer, and they are connected to the Wi-Fi network. After they have used the network once, those credentials can be saved on the device to automatically authenticate the next time they are in a CableWiFi hot spot. Some of the major cities where the cable hot spots are up and running include: New York, Los Angeles, Chicago, Philadelphia, Atlanta, Baltimore, Boston, Washington, San Francisco, Kansas City, Mo., and Orlando and Tampa, Fla. Customers can check their broadband providers’ Web site for a nationwide coverage map. Comcast most recently announced Chicago and Atlanta as cities with public Wi-Fi hot spots as part of the Cable Wi-Fi Alliance. And on Monday it is officially announcing Washington, D.C., as the next city to get Xfinity Wi-Fi. The company has set up public Wi-Fi hot spots in areas inside the city, such as Adams Morgan, Capitol Hill, Dupont Circle, and Georgetown. It’s also set up hot spots in Bethesda, Chevy Chase and Silver Spring in Maryland; and Arlington, Alexandria, and Woodbridge in Virginia.